Today the most talked about man in Sri Lanka, is Gotabaya Rajapaksa. His Excellency, brother Mahinda Rajapaksa has become his follower and worshipper and second best. There is no wrong that Gotabaya can do, but there is everything he can do, as he is a GOD no less, one could say the “Anti” or negative God, to stupid blind worshipers, especially some professionals. However his name rings a bell in the sensible, it rings with negative and ominous vibrations akin to the Anti Christ – Satan. He stands alone, not really associated closely with anyone, devouring any object or man that gets in his way and decimating it, he is more akin to a modern day Frankenstein, in a family of Borgia Rajapaksas. The Rajapaksas plot people’s downfall, plan what wealth they need to acquire for generations. usually by fowl means, protect the most evil and plan their succession just like evil kings of yore. Many have been his casualties due to the positions they held or the encounters they had with him, or both. These range from the people of the North during the last stages of the War to Gen. Sarath Fonseka to Lasantha Wickramatunga to Frederica Jansz to lesser known media personnel to Directors General of the BOI to many others to street dogs in the Fort area. 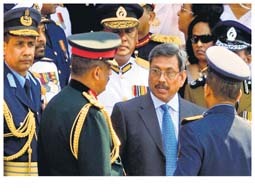 The most well known vendetta between Gotabaya’s dislike of Gen. Fonseka goes back to school days. Sarath Fonseka was always one or two steps ahead of him in everything, be it swimming or achievements in cadetting. Back together in the Army, Fonseka was forging ahead of him always, and this most likely became a psychological problem in the present time. Gen Fonseka, with over a career of four decades, has been Sri Lanka’s most high-profile and arguably its most tactically successful army officer. While Gotabaya masterminded the decision of taking Sarath Fonseka on as Commander of the SL Army for matters of expediency, he did not want him around for a longer term. 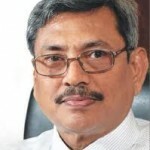 Gotabaya in typically Frankenstein attitude, openly stated on BBC Hard Talk in 2010, that if Sarath Fonseka were to talk honestly about war crimes in Sri Lanka, he would be guilty of treason and that he should be hanged. The whole 3 year episode of harassment and turmoil for Fonseka, with hounding even today, is Gotabaya’s insecurity of being second to him. Adding insult to injury of the Rajapaksas was the fact that mere Fonseka decided and desired even to “think” of running against them in an election. CA Chandraprema, who regularly hallucinates about certain key figures when he wants to be in their favour, wrote the well known piece of propaganda, about the Frankenstein Gota saving the country and a host of other details in the book “Gota’s War”. A sequel should be written to this titled “People’s war against Gota”. This would be the real story. He is also the architect behind almost all of the post war violence and quelling of people’s basic freedoms. His intellect is so diabolical that he cannot use it rationally with good intentions. Being consultative on any issue is unthinkable for and he does not know the meaning of participatory development and building consensus. There are many detailed accounts of people abducted in white vans, some of which have been traced back to the Defence Forces. No commander of any force, would take such bad decisions. So it is clear, where orders come from. To explain his diabolical intellect further let us look towards two or three convoluted exercises with the “Gota” touch. The Grease Yaka incidents, are those which mimic similar tactics in post war periods. Gota is no doubt an avid reader and copies twisted actions of others constantly. In his quest to establish a firm military command in the Northern province, a situation had to be created to show that the environment in the North was unsafe. So the Yakas ran out from army garrisons, back to garrisons or stations where they were officially ensconced. If one were to take a detailed look at Mulaitivu, it is the perfect example of a militarized garrison state. New and permanent buildings have been erected every 10 kilometers and there seems to be more military than people in this District. Creating such situations also flushes out small arms that are with the people, who bring these out especially to chivalrously defend women. This has also occurred in the states seceding from the former Soviet Union. The second example is the creation of Bodu Bala Sena and his aiding and abetting of this Monk’s Army. There are many theories on how Bodu Bala Sena came into being. For sure, it is NOT to protect Buddhists or Buddhism, as their militant tactics are anything but Buddhist. Having such a militant propaganda outfit, serves Gota and his family’s interests very well. Motive No 1 is to get rid of any extreme Muslim groups if at all. So the Halal issue which was around for decades was showcased for that and purposeful rabble rousing was initiated. This is pretty much like the case in several kangaroo states of the world. So the dirty work of banning Halal was carried out by gullible Sinhalese. Motive No 2 is to tell the world that other religions are steadily acquiring the space of the Sinhala Buddhist. So who better than to protect the country? This bunch of Bodu Bala Borgia Rajapaksas. 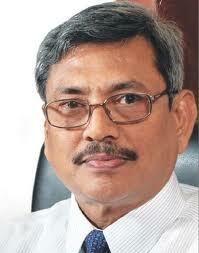 Gota has already sent a message around to say that he will be the next best President of Sri Lanka. This is why BBS has total immunity against punishment, no matter which crime they commit. The third recent most was the sad fate of Grandpass and its residents. The real truth is that Gota wants both the temple and mosque out of the area for purposes of UDA development. Rousing the Sinhalese against Muslims was a seemingly good idea, where the mosque would be displaced first and then the temple. But intervention of senior monks and powerful people could not change the situation as he wanted. Gotabaya Rajapaksa could very well depose his brother and come into power. This is how ambitious and calculating a man, he is. Staying in power is to rob the country dry and feather the Rajapaksa nest. Untold deals go on where millions and millions of dollars are taken. The recent case that came to light was the Krrish deal. There are many hotel chains and businesses with citrusy names which are front organizations of Gotabaya and family, bought on their behalf by the country’s richest person. His taste is such after being a menial worker in the US, that a pet dog needs to be brought in from Switzerland. There are also rare and piranha like aquatic life for his visual pleasure in the official residence. One has to be a Frankenstein to enjoy such sights. Gobbling up the UDA under Defence, a move unheard of except in similar regimes perhaps was a way to have control, over celluloid and artificial city development, with no human face. This greedy and cold person somehow identifies with US city development and cold Singapore style “benevolent dictator driven” urban planning. This is also the best way to keep a personal eye on lands which have potential for the greedy grasp of the Rajapaksas or give it over for so called “development” with fat commissions involved such as Krrish. The studies on land grabs all over the country especially virgin areas in the North and East is indeed a crime against nature and humanity. It is unprecedented that this particular Permanent Secretary and supposed mere civil servant without any qualifications has such unprecedented powers, exceeding that of the Executive Presidency. What do the people do? Let us be gobbled up by Gota Frankenstein or we use our sovereign powers and get rid of this family? After all people’s power is only through the electoral process and this piece of vermin was certainly not elected. Come on guys…. Did you all forget how well the garbage is getting collected and the streets are all clean?? That is what our aimless Defense Secy is up to these days. Create pseudo companies to steal assets and properties. Prop up front projects to lease valuable UDA lands in and around metro areas. All this is happening because there is a group of willing group of pandang karayas ready and able to do their bidding. Funny thing,,,, some of them are relatives of some of our friends who rant and rave in this very page. Ego is a very dangerous thing. The fall will come. Unfortunately for some of us, it might not be soon enough. The streets are also cleaned off by ‘arresting all stray dogs’ off the streets of colombo. Guess ? The dogs,all mangy looking and rabid with fleas etc were sold to the Koreans and Chinese in Sri Lanka.This news came straight from the horses mouth. The devil family made money in foeign exchange on ‘our flea bitten stray dogs’. So much for our great democrtatically elected R family. Kill the dogs…..save the cows and feed people with Polkudu and grass. Already Rajapakses have monopolised Sri Lanka’s Beaf market with mafia cattle slaughter and distribution. Cattle slaughter are carried out inside selected Army Camps. I think he was good for war,now time of peace we need some one more flexible.Creating BBS and grease yakkas is typcal millitary thinking. this will back fire and more people will be victimised. We need a change from Rajapaksa, NEED A CHANGE!!!!!!!!!!!!!!!! jehan1 – how do you propose to get around this .– need a change? I see ‘suggestions’ and ‘try ons’ have been shot down.Is there another way? Hi Sach—-Just saw your reply to mine further up on this thread. Cut the crap sach.Do not accuse without knowing your facts. Yeah! love for the singhala youth? Aren’t they human bengs? Here it is.I saw bodies floating in the Mahaweli river.They were dumped over the Kandy/Kundasale bridge by the army and police. There were no Tigers prowling anywhere/nowhere in Sri Lanka. I was chased on the Kurunagala station platform when thugs attacked the Tamils who got off the train.I narrowly escaped with injuries,many died.Enough was enough.Later in years if my sons joined the freedom fighters what would you have done in my place? Sach – come on give an honest answer. Untill they are woken up to live again. Gotabaya Rajapaksa is a well respected man in Sri Lanka. He was a good organizer and a planner. He had a vision. When talking to even to foreigners who interviewed him, he answered diligently. He never minced his words, unlike former US Ambassador Robert O Blake who was ducking questions and mincing his worlds at a TV interview in 2008. Who else know him better than Sri Lankans? He has a perfect balance personality. I hope this book will be a flop.